This Kreature is the meta-form of Grubtile. It's an efficient, bloodthirsty killing machine that will seize its prey in its barbed raptorial forelimbs and devour it alive. 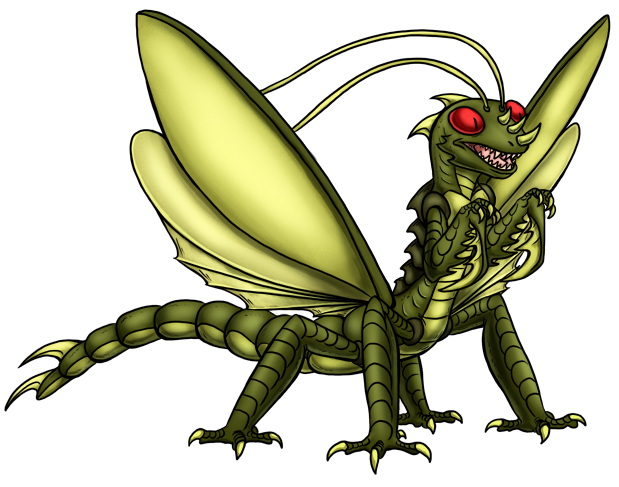 It can lash out and strike an opponent multiple times in the blink of an eye. It isn't even safe among its own kind; the female is 15% larger than the male and might decide to make a post-coital snack out of him. It is a swift, agile flier - if it finds itself being pursued, it will perform an inside-loop to position itself behind the enemy for a counterattack or escape.